What is the Difference Between Good and Bad Fats? It’s probably fair to say that no other nutrient has received more press coverage in recent years than fat and much of it has been contradictory. The general consensus now seems to be that not all fats are bad. For many years consuming fat was blamed for excess weight gain and it’s easy to see why. At 9 calories per gram, it has twice the calories of carbohydrate and protein. But fat is necessary for good health. It supplies essential fatty acids, which the body can’t produce on its own. Fat also delivers vitamins A, D E and K, known as the fat-soluble vitamins, into and around the body, keeps our skin soft, promotes proper eyesight and fuels the body. So, does it mean that we can now indulge in all of our favourite fattening foods such as chips, hamburgers and doughnuts? No not at all. More important than how much fat we consume, is the type of fat. 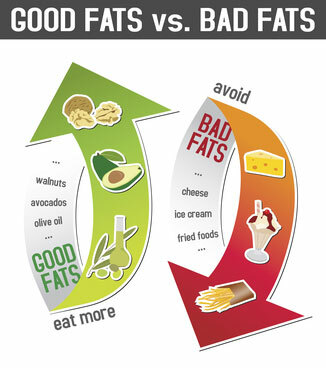 There are good and bad fats. The Harvard School of Public Health advises that we should be choosing foods containing healthy fats and limiting those foods containing bad fats. Why Did the Low Fat Diet Fail? For many years we were encouraged to cut out fat from our diets and follow a low fat diet. This diet made “fat” a dirty word. People avoided eating all fats, even the good ones, thinking it was harmful. But by cutting out most, if not all, fat from our diet meant we were missing out on essential nutrients present in good fats. Not only that, it was often substituted with refined carbohydrates and starches such as white rice, white bread, potatoes and sugary drinks. Food manufacturers began churning out low fat products to fool us into thinking they were healthy. The problem is removing all fat from food also removes all the taste. So food manufacturers compensated by adding sugar to make the food more palatable. Our bodies digest these carbs and starches very quickly, leaving us hungry again in a short time. In actual fact we were consuming far more calories than ever before. In order to choose between the good and bad fats, we need to understand the different types of fat, which ones are healthy, where to find them and what their benefits are. Saturated fats tend to be solid at room temperature and are mainly found in food from animal sources, such as dairy products, bacon, beef, poultry with skin and lamb. But they are also present in tropical oils such as palm oil and coconut oil. The relationship between fats and health has come under much scrutiny recently and it is saturated fats which have caused the most controversy. Most experts are in agreement about trans fats and unsaturated fats, but it is the question as to whether saturated fats are harmful and how much we should be eating, which has fuelled the most debate. What has become apparent however, is that cutting back on saturated fat can be good for health if replaced with unsaturated fats. But cutting back on saturated fat will have no benefit if it is replaced with refined carbohydrates such as potatoes, white rice and white bread. This is because eating refined carbs does lower the “bad” LDL cholesterol, but it also lowers the “good” HDL cholesterol. In fact sugar is more harmful to our heart health than fat. There are two kinds of trans fats: naturally occurring and artificial. Small amounts of trans fats occur naturally in some meat and dairy foods. There is insufficient data to determine whether these naturally occurring fats are harmful to our health. Artificial trans fats are created through an industrial process. Manufacturers add extra hydrogen to polyunsaturated vegetable oils to make them more solid and extend their shelf life. Trans fats typically appear in junk food and fast food and will be listed as “partially hydrogenated oils” in the list of ingredients on packaged processed foods. It is the manufactured trans fats found in processed foods which are the true villain and pose the greatest health risk. They raise the bad (LDL) cholesterol levels and lower the good (HDL) cholesterol levels, increasing the risk of developing heart disease, stroke and are associated with an increased risk of type 2 diabetes. Trans fats were first introduced to foods because they were inexpensive to make, increased the shelf life of foods and gave them added taste. They are still found in many foods such as doughnuts, cakes, pie crusts, biscuits, frozen pizza, cookies, stick margarines and other spreads. To determine the level of trans fats in packaged foods look at the nutrition facts panel where it should read “0 grams of trans fats”. Also check the ingredients list and avoid anything that says “partially hydrogenated oils”. Unsaturated fats tend to be liquid at room temperature and are found in plant oils. Monounsaturated fats help reduce bad cholesterol levels in your blood thereby lowering your risk of heart disease and stroke. These are found in olive oil, canola oil, as well as avocados, peanut butter, nuts such as almonds, pistachios, pecans, cashews and seeds. Polyunsaturates occur in the germ of all grains and are extracted from seeds such as sunflower, safflower, soy beans, cottonseed, maize, sesame and grape seed to make cooking oils. Polyunsaturated fats contain essential fatty acids that are essential for good health and wellbeing. They assist in the body’s proper functioning, but cannot be manufactured by the body, so we must get them from food. Omega-6 fats – Are found in vegetable oils such as canola, safflower and sunflower oil, and nuts and seeds such as almonds, pecans, Brazil nuts, sunflower seeds and sesame seeds. They are essential for growth, cell structure and maintaining a healthy immune system. Omega-3 fats – Are found in oils from cold water fish such as salmon, mackerel, tuna, herring and sardines, and in flax seeds (linseed oil). They help maintain a healthy immune system, assist in brain and spinal cord function, as well as regulating blood pressure and blood clotting. The overall message now is not about cutting out all fat, but about substitution. Cutting out bad fats is good for health only if we replace them with something that is healthy. Learning about the difference between good and bad fats will help us make the right food choices.